I’m a devoted husband, father, musician and songwriter, who got a job after 9/11, to try to make a difference in the our world. I started writing songs after I came to realize that the war on terror was all phony. It’s Rodolfo from the Bus. I read your book and I commented on your picture of Martin Luther King Jr. Do you remember me? I want to be in communication with you. In particular about what can we do about all of this that is going on. Listen I am aware of the Situations that are occurring and have been occurring since 1913 to the present and how its all coming to a head. I appreciate people like you who are using what they have got to spread knowledge and truth to the people who are asleep. All of this however is its own form of “Rhetoric” without actions. I understand knowledge for the sake of having it and being aware. However the true test is how you can use it to increase your survival capacity. this takes organization etc. I’m sure there is something like this going on. Just keep spreading the word brother. All the alternate sources for information are virtually unknown by most. Being aware of a problem, is always part of the solution. Thanks for your help today. On the bus now! – the Astoria girl going to trader joes. 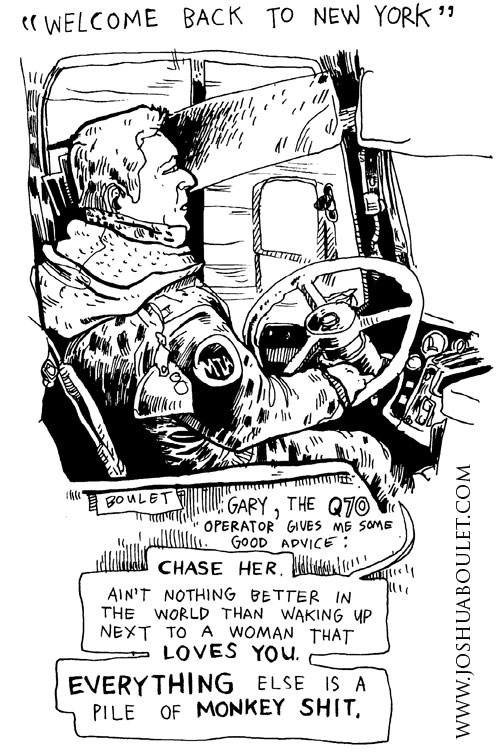 Gary, a pleasure talking to you on the Q23. Wishing you well and just one of your many passengers who appreciate your quest to serve all via word and deed, getting people to their destinations with lots of humor, good sense, and a whole lot of steel with four wheels. Hope to see you again soon before you move to your next route! Gary, best of luck with all your new endeavors into 2015 and thank you for keeping it real each morning, wending along with your Q23 through many of the diverse neighborhoods of Queens, generously dishing out your poetry with ample wit and good humor. Thank you for granting a baker’s dozen seconds of time in order to capture just a fleeting moment of that inner substance that “drives” you so uniquely in your role as a steward out in Queens. With the festive holiday seasons of Christmas and Hanukkah converging, Gary you remind us in your brief verse of the less fortunate among us, those sadly needing to make the harsh journey out to one of your former bus route destinations: Rikers Island, a location containing perhaps the most infamous of all prisons here in the vicinity of New York City. I’m certain your added care and concern for your passengers provided a heartened dose of compassion and comfort to the countless many during those daily trips along that tremendously overburdened via dolorosa. Happy New Year Gary!! Hope to see you soon again. Please let us know when you change routes from the Q23. Hey Wanda, I’ll be back on the 23 in the afternoons starting in Sept. Hope to be giving you a lift! Pleasure riding with you mornings on the Q100 on my way to the US Gulag. I’m checking out your website like you suggested and appreciate your message of peace and justice. I’m a public school teacher of incarcerated youth. Also read An Act of State that I saw on your bus. I have to believe that truth will out and with more critical thinkers like yourself it will be sooner rather than later. Every act of kindness or solidarity counts. Hope you like, and share with other veterans and supporters you may know. Be safe.